Baby, it’s hot outside! This post is short and sweet, just like the recipe. There’s not much to say about this treat, other than it’s delicious! I am loving all variations on the banana ice-cream and this is an old favourite. Blend or process in the food processor until combined and resembles soft serve ice-cream. 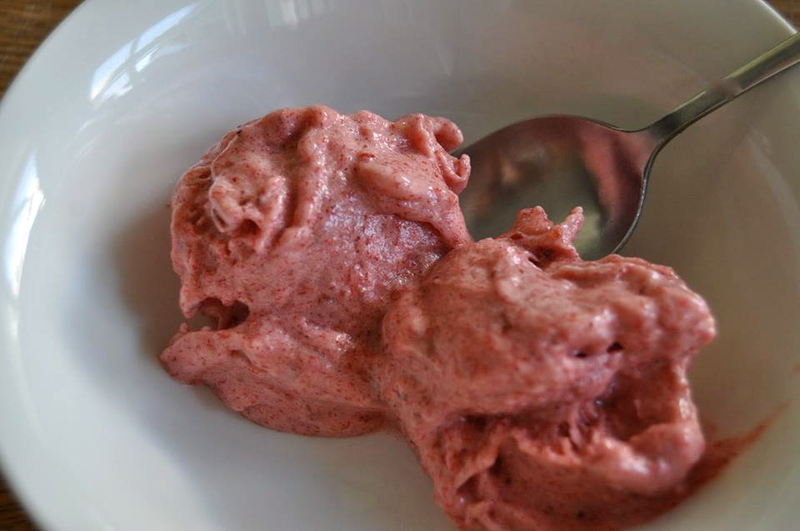 This entry was posted in dessert, raw, snack, vegan, vegetarian and tagged fresh, healthy, raw, raw vegan ice cream, recipe, strawberry, summer, vegan. Bookmark the permalink. Do I need an ice cream maker to make this? Also can I put two bananas in the freezer the night before? Should I peel them? Thanks for the quick reply 🙂 I will let you know how it goes! 1. I did not freeze the fruit long enough, I used bananas and whole strawberries that I froze for 2 hours in the freezer.